Getting old is inevitable. It’s a shame, I know, but there is nothing we can do about it. If, however, anyone tells you to grow old gracefully, I’d suggest that you give them a quick kick in the nuts – ‘cause that’s what they’d deserve. I want to do the opposite. I want to grow old disgracefully and it would seem that KTM, with their new and heavily updated 690 SMC R, are more than happy to help us do just that. The Austrian firm have taken what was already a very nutty bike and make it even more so. The revised LC4 engine produces an extra 7bhp (74bhp) and 4Nm (73.5Nm), for starters. I know what you’re thinking. It’s still a big single like and it still ought to be, well – just not that nice. It would be a fair assumption; big, single cylinder engines in days gone by have quite often been lumpy, heavy, awkward things. KTM have been developing this, the LC4 engine, for over 30 years, however, and reckon they have got their little lump in a pretty sweet spot. For the latest iteration, they have added an extra balancer shaft, which, coupled with a super lightweight piston, is said to reduce vibration significantly. The power assist slipper clutch also does its best to make the bike even more smooth and ridable. To keep things super sensible, there is a whole new electronics package, too. The SMC R comes with a ‘Quickshifter+’ allowing full throttle upshifts as well as clutch-less downshifts, two rider modes, switchable cornering ABS and a lean angle sensitive traction control system. That’s not all. It is, after all, a major update, with a whopping 65% of the SMC R’s components being brand new. 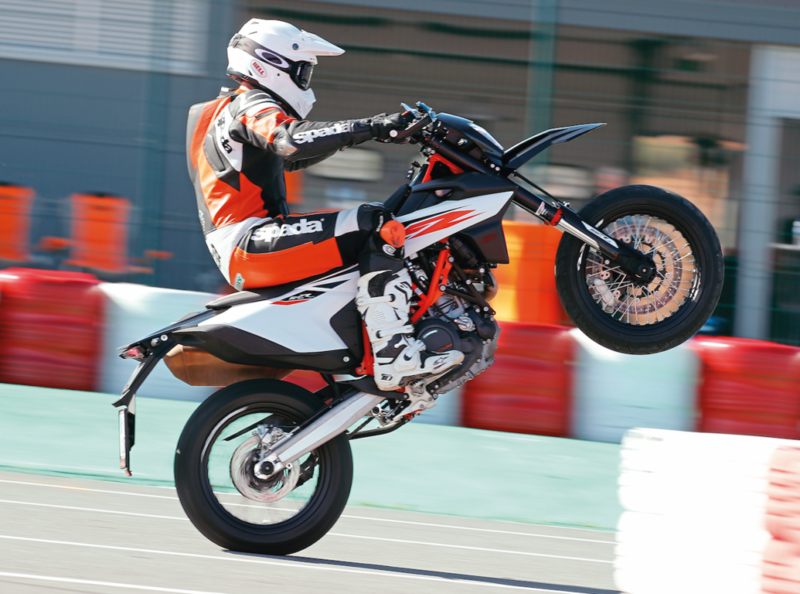 The bodywork is sharper and slimmer than that which dressed the outgoing model, emphasising the KTM’s ‘ready to race’ attitude, almost as much as the fancy new WP Apex suspension does. They have also made the SMC R that little bit more practical by adding an extra 1.5 litres to the (now) 13.5 litre fuel tank (which, incidentally, isn’t just a fuel tank, it’s a subframe, too), and gifting it with a USB port in the dash. Handy. 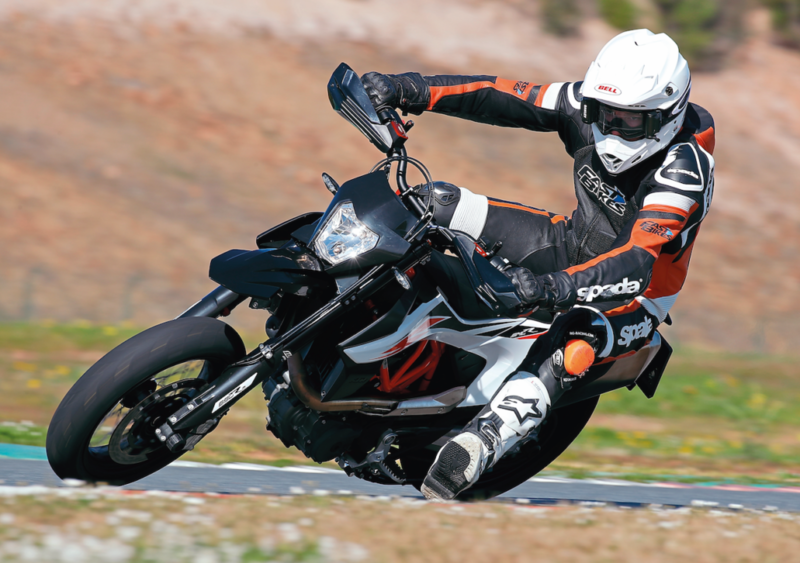 So to find out for myself, but most importantly for our esteemed readers, just how good (or bad) the new model is, I headed off to the Algarve to do some really sensible motorcycle riding. But that didn’t quite go to plan. 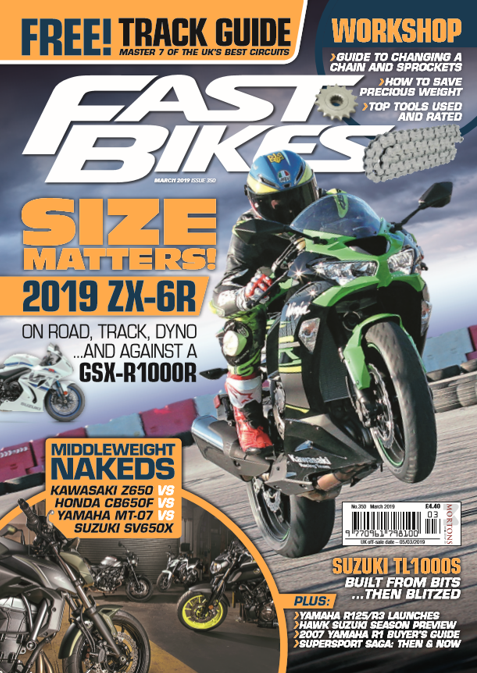 Read how Boothy got on in the April issue of Fast Bikes – out now!